� Promotes proper spinal alignment while nursing in bed, eliminating pillow propping: Having baby�s spine and pelvis aligned during the nursing process prevents spinal misalignment and the complications that result from it. 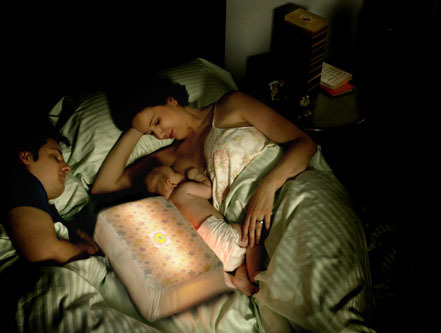 � Self-contained �soft glow� light: Allows Mom to see what she is doing without disturbing her baby or partner. LED light unit within the pillow provides a comforting glow so that the mother can see what she is doing (or just to look adoringly at her baby). � 30 minute automatic timer : The lighting unit has a programmable chip that shuts the light off after 30 minutes, thus saving on battery life. In addition the light can be turned on or off manually by pressing the top of the pillow. � Promotes a safe co-sleeping environment: Our pillows size and sturdy construction make it an effective barrier between sleeping partner and baby. This helps insure a safer co-sleeping environment for all providing peace of mind for both mother and partner.